Woodworking projects have always intimidated me. I've failed miserably at previous attempts, I don't own any power tools (except for a drill) and I have a bad habit of cutting and measuring incorrectly. 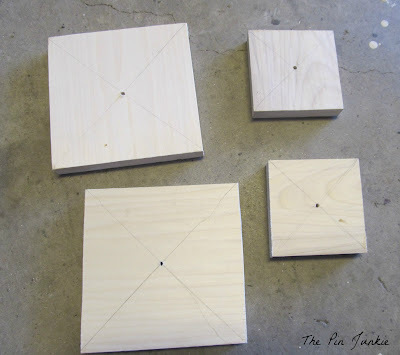 After I learned how to measure and cut trim and moulding for my laundry room makeover and after learning how to frame a mirror in my bathroom, I had a little more confidence and I was ready to try another woodworking project. The idea for this project came from here and here. 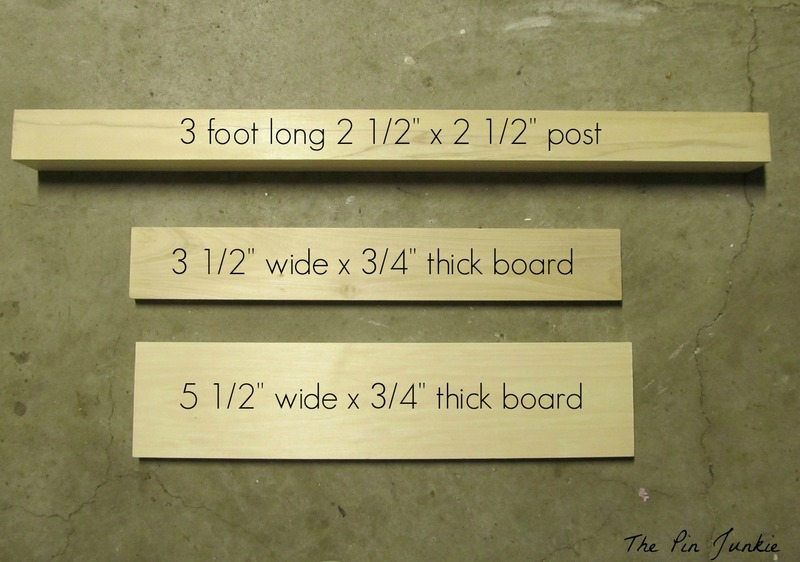 Both tutorials give different measurements for what sizes of wood to use. I used the directions as a guideline, and ended up using my own measurements. 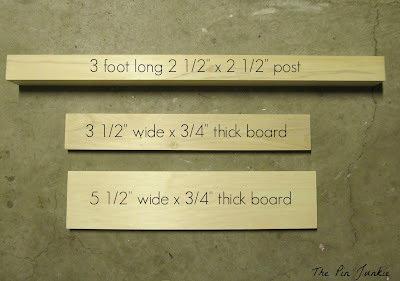 My post is a bit slender and petite since I used a 2 1/2" x 2 1/2" post. A 4" x 4" post would have probably worked better, but I don't have any power tools to cut it and the smallest 4" x 4" post at the store was too long to fit in my car. These are the materials and measurement that I used, but the measurements can be changed easily, especially if you have scrap pieces of wood left over from another project that you wanted to use. I started with these pieces of wood. I cut the boards so that they were squares. I cut three 3 1/2" x 3 1/2" squares and two 5 1/2" x 5 1/2" squares from the boards. I pre-drilled a hole in the center of the squares and on both ends of the post. This made screwing the pieces together much easier. I attached one large and one small square to each end of the post with screws and counter sunk the screws so that they were flush. 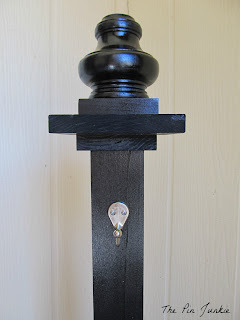 I pre-drilled a hole in the last 3 1/2" x 3 1/2" square and screwed in the finial. I couldn't find a finial at the hardware store, so I had to improvise and I used a foot instead. Then I used Liquid Nails to glue the finial with the square base to the top. I painted the post with Rustoleum black glossy spray paint. I used spray paint but you could use whatever paint you want. Once the paint was dry, I attached a hook. This little post is going to be so versatile. I can tell I'm going to have a lot of fun playing with different accessories for different seasons and holidays. Great project! I totally want to make this! Thanks for posting. I've been wanting to make something like this for a plant shelf in my living room! Great tutorial and I'm pinning this one. Maybe I can talk the hubster into making it for me! What a good idea! This would be great as a plant stand! 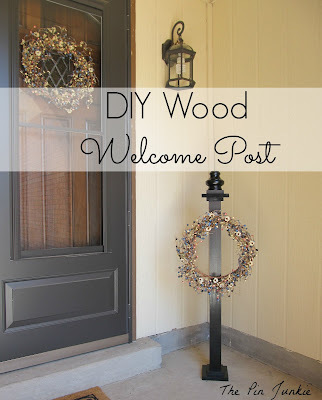 I have never heard of a welcome post, but I am so in love with the idea--how sweet! I'm so impressed that you made it yourself and that wreath is so beautiful. I popped over from Monday Funday--thanks for sharing! Thanks for inviting me to your party Britney! Great idea and so practical and pretty. Thanks for the tutorial. Visiting from The Scoop. What a cool project. Thanks for the detailed instructions. I really love how this turned out. What a cute idea. I love how it turned out. Great for all seasons. Your welcome post turned out great! Thanks for the tutorial! Thanks Kelly! I just hope it doesn't blow over during a windy day. I think it is darling and really makes an entry way! Way to Go!! I LOVE this! Pinning thanks for sharing! This is a great idea! I loved how it turned out :) Thanks for linking up at our party tonight!! Visiting from the Pinterest Power Party! I'm actually completely new to power tools, but I'm super excited to start learning and doing my own projects soon. Great job! What a great idea! Thank you for spreading JOY and sharing at the Oh What a HAPPY Day party. Fabulous idea! Thanks for sharing at Party In Polka Dots!!! Fantastic Project! 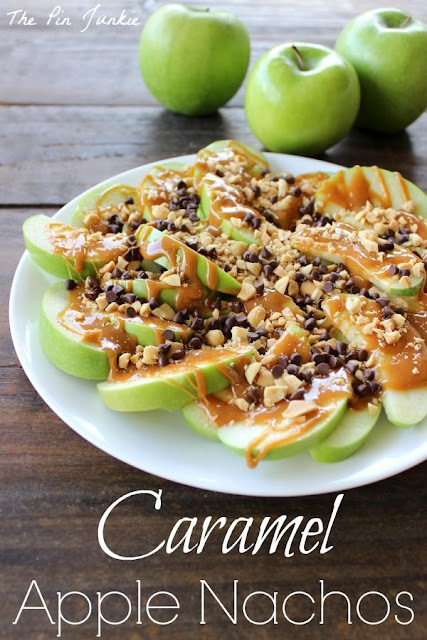 Would love for you to share at Simple & Sweet Fridays. New Follower! 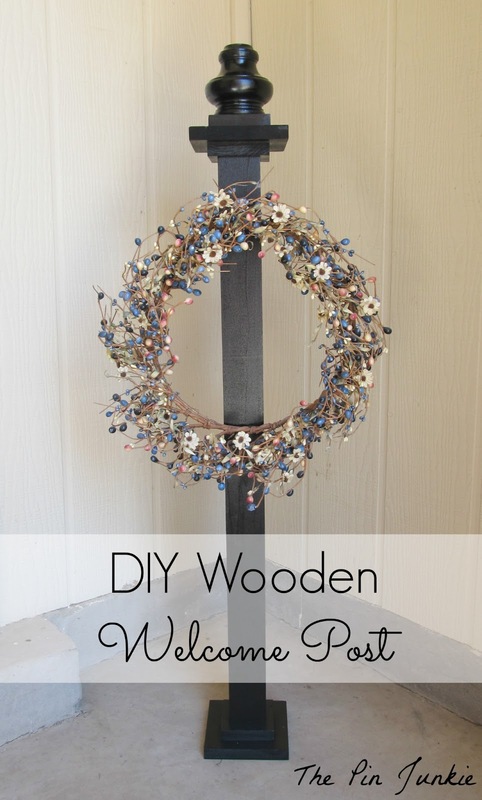 Great tutorial, I need something like this for my porch! Stopping by from the Pin Me linky and pinning! This post looks great! Super cute! Pinning this. Thanks for linking up at Romance on a dime!! Love this! I would love to have one on my front porch. Great job! 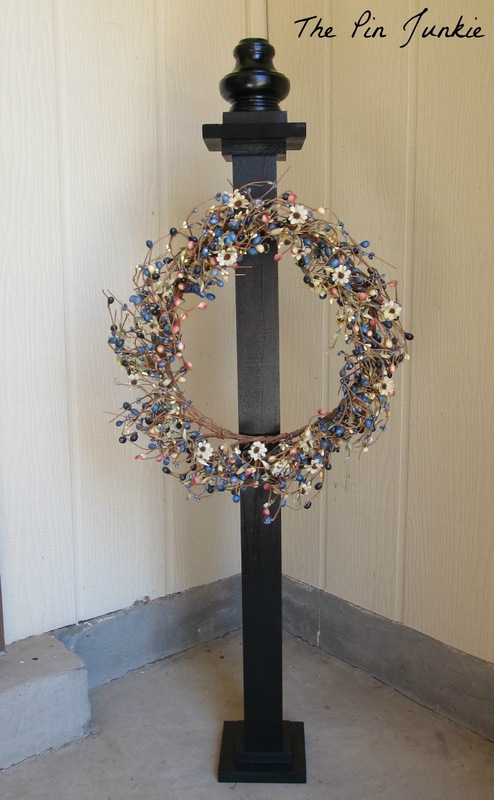 Very nice little project that makes a statement ;-) Plus I love your wreath! Thanks for the feature Jessi! This is so pretty, and I love the color you chose to paint it. Your wreath is gorgeous on it! I'm a bit intimidated by woodworking projects too, although my husband has been teaching me how to use all of his power tools. It's one of the most relaxing things I've done, sawing boards in two to make a headboard. :) Thanks so much for linking up to Inspire Me Wednesday. Featuring you in this week's issue. Turned out so cute. I have a couple I made out of vintage post rails. They are not as tall, but I use them indoor on my mantle and table. I love them! Thanks for sharing with SYC. This is a GREAT idea! We have a wrought iron front door so hanging anything on it is a chore, or my hangers get bent up. Awesome idea, thank you for sharing on Much Ado About Monday!! 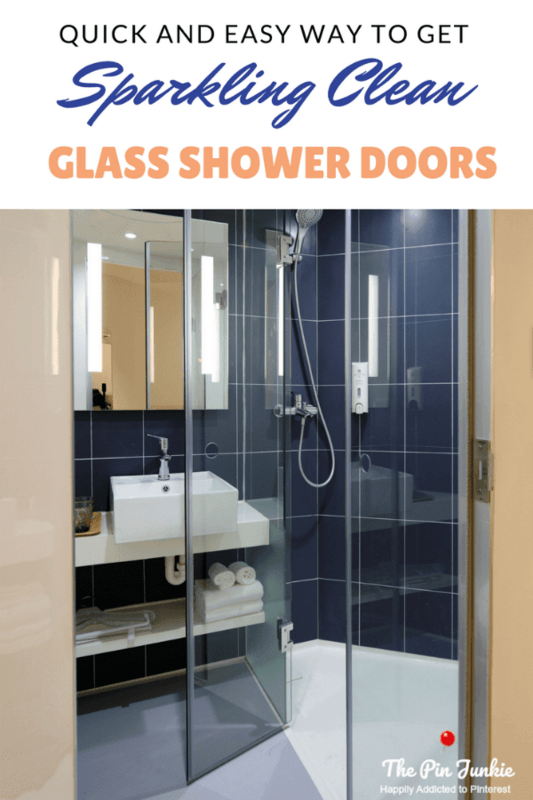 most hardware stores where you purchase your items will cut for free your measurements. Cute idea. I had a mini fence by front entry. I took it down but one post I had and use for my electrical box for our garden lights. 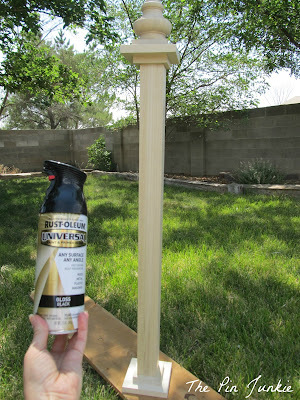 So my husband made a birdhouse and put on top of the post. I used an antique glass kitchen knob for the perch on the bird house. I had a small flower sign and I put it on the perch with wire. So my entry has a bird post and a water garden with a fountain. This turned out great! I think I might just have to try my hand at one :) Thanks for sharing! How cute is this! I pinned it! I love this idea. You could have one for each season and match the door decor. I never thought of it before. You did a great job! Thanks for sharing at What'd You Do This Weekend. Okay, this is awesome! I'm adding it to the honey do list! I love this! I love that I could change out what I hang on it for each season and holiday or whenever it suits me! I have a wooden American flag left over from 4th of July, but I'm looking forward to changing things for different seasons and holidays. It should be a lot of fun! Great idea! I love the color! Very cute! Perfect addition to any porch! Thanks for the feature Andrea! Thanks for stopping by Gina! This is so simple and yet so elegant! I love the touch it gives to the front porch! I may just have to make something like this! Thanks for the invitation Ruth! I linked up. Love this! 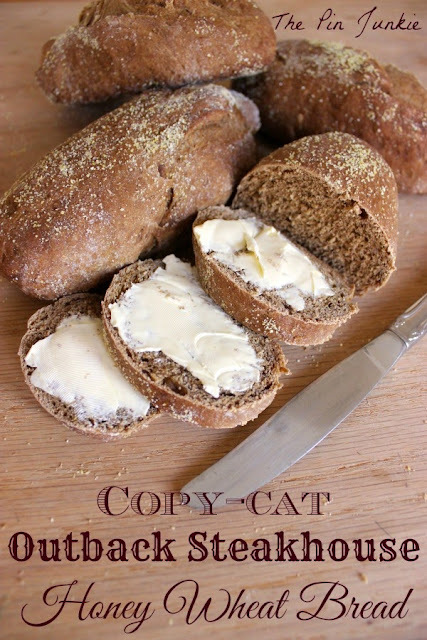 It is featured today over at the DIY Sunday Showcase Favorites! Thanks for the feature Jennifer! This looks great! I am absolutely terrified of wordworking projects, myself, but this one gives me hope! I'm your newest follower! Stopping by from Hoyby Crafts. Love the look of the welcome post! Great job! 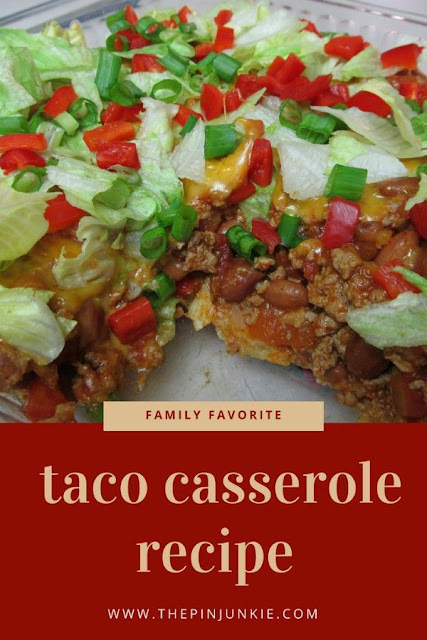 Thank you so much for linking up to the Tuesday To Do Party!!! Can't wait to see what you share this week!! What a super cute idea. I will be featuring this tomorrow night at my Sizzle into Summer party that opens at 8pm EST. Please stop by and pick up an I've Been Featured button. Thanks. Thanks for the invitation Britney! I linked up. Thanks for the feature Kathryn! That is adorable! I really would love one....I may have to make one for myself! Thanks for sharing at the Homeacre Hop! We hope you join us again soon! I love it! Pinning and featruing your post! 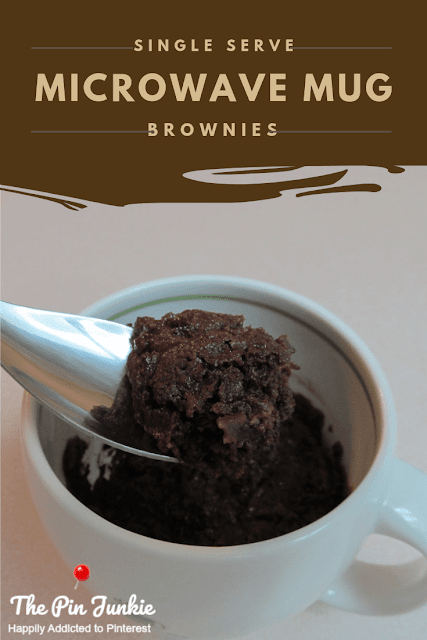 Thanks for linking up to Show me the Goods month end link party. 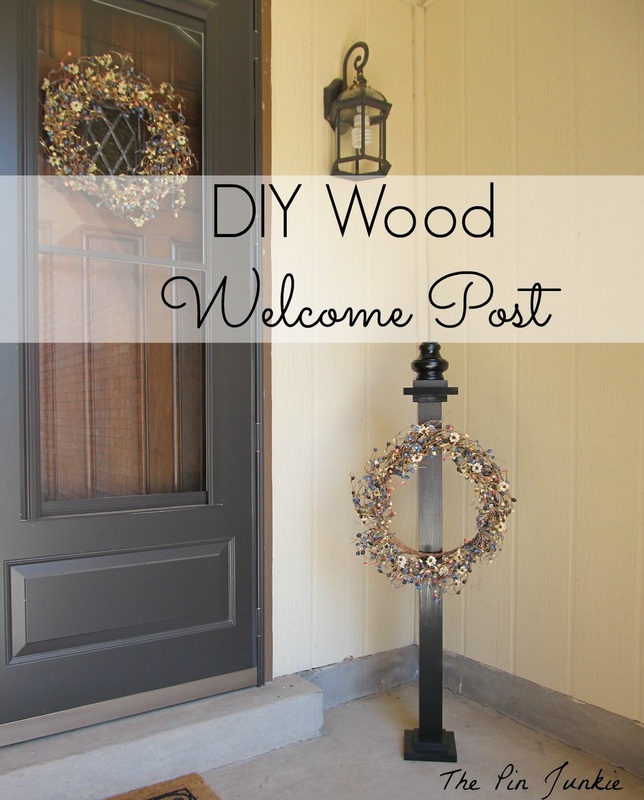 I love, love, LOVE the idea of a welcome post!! So, flipping cute..Thanks for sharing at Throwback Thursday!! Hi there! Just found your blog. I like what you did with the post, but I LOVE your black screen door! Where on Earth did you find it? Thanks Lisa! We had to replace the screen door about a year ago and Home Depot was the only place we could find a replacement for our double doors. We got it in dark brown (which looks black) I'll tell Mr. Pin Junkie you like it. It might make him feel better, because he wasn't happy about how much it cost! Very cute display using your post!